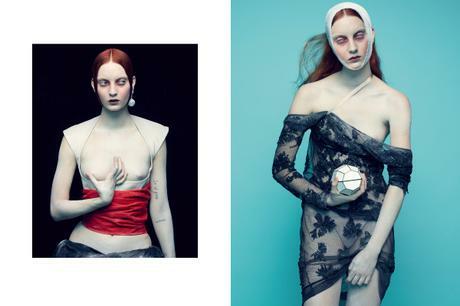 starring fashion enigma codie young styled by guillaume boulez and photographed by nicolas valois. the perfect timing and care taken to produce such a super edgy emotive spread without the help of location, graphic tidbits or last years favourite trick:’les collages’ is what makes this such a powerful story. the interpretation is multi-layered without being confusing while the deliberate historic innuendos are subtly balanced. a well awarded piece of minimalist-renaissance-nostalgia with attitude.